Privacy in a townhouse? That doesn't seem possible. Many people who choose townhouse living do so at the expense of feeling like they have any real privacy. But it doesn't have to be that way. Miller & Smith designed Arbor Glenn cluster to maximize privacy. The 44 townhouses are arranged in groups of four to six in a "Z" row, which means that each house feels more private. But the privacy doesn't stop there. A private, one-way road loops the cluster, adding to the charm of the neighborhood and keeping through traffic out. So while Arbor Glenn is right off busy Lake Newport Road, and close to Reston Parkway (only the soccer fields stand between the two), the neighborhood is very quiet. 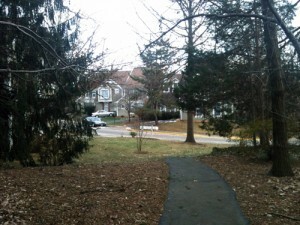 Built between 1986 and 1988 when the North Point area of Reston was built up, these spacious townhomes have three or four bedrooms. While the community is close to North Point Village Center and the bustle of Reston Parkway, it's nestled in a wooded area that makes it feel more secluded than it is. Arbor Glenn is less than a five-minute walk to North Point Village Center and Lake Newport pool (Reston's only Olympic sized pool), and Reston Town Center is less than 2 miles away. And Arbor Glenn has all of the pros of a townhome community, including beautiful common areas that you don't have to maintain! That's right; you don't need a lawnmower if you live here.